Journalists addressing PR professionals during the MaKi conference in London. Pick up a book on media relations or take a PR class and you will read lots of best practice. The course / book will cover topics such as press release writing, media pitching, the responsibilities of a journalist and the value of positive vs. negative press. There will probably very little mention about the value of attending journalist conferences in the industry. 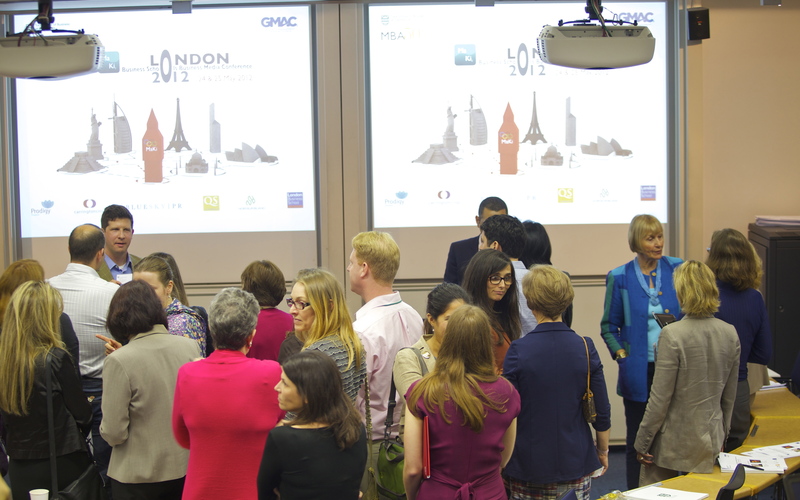 Representing Duke University’s Fuqua School of Business, I attended the Maki journalism conference in London last week. Some 35 journalists, divided into several panels, shared their perspectives with the public relations and communications professionals from other schools in attendance. After the panel sessions, the PR professionals do a quick meet and greet with the journalists. Some of the journalists come and go, while others stick around to discuss everything from their editorial calendars to their children’s activities. Organized by my respected colleagues Kim Keating of Dartmouth’s Tuck School of Business and Matt Symonds of mba50.com, the conference is a terrific forum for networking with journalists and colleagues from the industry. The ROI on attending such conferences has been phenomenal. I have seen a number of positive stories that have generated as a result of attending previous conferences in different parts of the world. At the same time, I am learning about some of the latest trends in public relations and taking part in various formal and informal best practice exchanges with other communicators in the industry. 1) Journalists. You are very busy. Your time is limited, you received hundreds of email pitches a day and you are facing unprecedented disruption in your industry over the past few years. That said, I encourage you to attend such industry conferences where you can share first-hand what you are working on and how PR professionals can help you. While there are plenty of PR hacks and amateurs out there, I would like to believe that that majority of us (at least in the business education space) do the best we can to represent our organizations while trying to help you do your job as a journalist. We want to know if you like receiving pitches via Twitter, the best time to send you ideas and story topics on your radar, and then respond accordingly. We would like to know what makes your blood boil about PR pitches you receive so we can avoid these behaviors in our interactions with you. Ultimately, such an open exchange in this type of small conference forum enables us all to work together more effectively and strategically. Journalism / communicator conferences such as Maki give public relations professionals the opportunity to interact first-hand with members of the media. opportunities to represent your organization to different journalists. You are also missing out on the opportunity for continual learning. Unfortunately, whatever you learned back in your university classes is somewhat out-of-date. The tools and pressures that journalists work with today are probably quite different and constantly changing. For the majority of us, Twitter wasn’t around when we took Media Relations 101 in university. For even others, neither was the web. We need to learn about the preferences of journalists from different types of publications and from different parts of the world (assuming of course that the organizations we represent are global in outlook). What may work in Brazil, might not in the UK. What an editor for a daily newspaper requires is usually quite different than what an influential freelancer needs. Finally, while there are general trends that apply, no two journalists are alike. Two different reporters from the same publication can have totally different preferences for story gathering. The better we know these personal preferences, the more effectively we can serve the journalist while best representing our organizations. Conferences such as Maki have enabled me to meet many new journalists and re-acquaint myself with some of my regular contacts. Meeting journalists in person who I previously only knew through email exchanges has been equally rewarding. Journalists at the conference shared the same sentiment. “I met in person for the first time about 10 business school folks who I have worked with by phone and email for years,” said Beth Gardiner, a freelance writer for the Wall Street Journal. And while surely you can meet journalists on your time in different cities, I think is safe to say that meeting 35 different journalists from various publications for meet and greet sessions is tough to pull off on your own. Your organization will reap ROI from the expense of attending, so long as you follow the advice from the panels and your 1-to-1 discussions with journalists. 3) PR Educators. Much of the content on this blog is dedicated experiential communications and learning. As a professional, these types of conferences are in and of themselves experiential learning. I urge you as educators to think about how you can bring this same sort of experience to your classroom. Students need to hear straight from the horse’s mouth – the journalists themselves. Just reading best practice in a book and hearing your views as instructor in front of the classroom doesn’t cut it. Even if you have a journalistic background or are a current media professional, it is important for students to hear from a diverse group. While a professional industry related conference as described at the outset of this blog would differ in nature to a format geared for students, there are certainly effective ways to make media relations and journalism come to life in the classroom. At the very least, curriculum and classroom sessions should highlight the value of meeting journalists in person at different types of forums. Watching sessions and interviews with journalists on video is another step in the right direction. Bringing journalists into the classroom and in interaction with students takes the experiential learning to a whole other level. We all, regardless of our profession, like to talk about ourselves. This applies to busy journalists. Many probably wouldn’t mind sharing a bit of wisdom with students, particularly if the journalist is an alumni of the school. Offering a small financial token of appreciation could improve the chances of bringing in high caliber journalists if the budget exists for something like this. Taking students to a newspaper newsroom to meet and interact with journalists and attending any conferences / events in which a journalist is speaking are additional ways to make learning experiential. One final thought, applicable to all. Picking up the phone and sending emails have their place. But regardless of how sophisticated our technology is today, and how it will further develop over time, there is nothing like meeting someone face-to-face. Attending a conference like Maki serves as a good reminder of this.